While many primo spots will be booked, plenty of locations should still be available, and may even give you a discount at this late date. 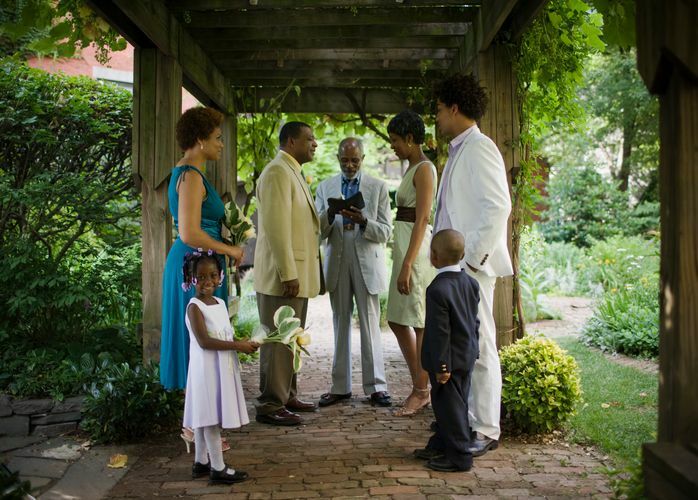 Save time by scheduling your ceremony at the same spot as your reception. You'll want to look at non-traditional spots; consider restaurants for the all-in-one ease or non-wedding spots like photo studios and film locations. If you want a short engagement but are having trouble finding a wedding location, consider hiring a wedding planner. They can be indispensable in finding the un-booked gems – if you're tight on cash, consider hiring her for location scouting only. Be flexible on the date and time which will expand the options open to you. Traditionally, a wedding dress must be ordered at least six months before a wedding, and bridesmaids' dresses soon afterward. However, for the bride short-on-time, there are other alternatives. Visit a large bridal emporium like David's Bridal, where they have a wide range of sizes in stock, ready to be worn. Consider using a dress not intended to be a wedding dress or bridesmaid dress, including prom dresses. Also, JCrew carries a line of dresses suitable for brides and bridesmaids looking for a relaxed style. You might also ask your bridesmaids to wear dresses they already have or to purchase a gown in a particular color. You'll need six weeks to mail your invitations, not to mention the printing time, stamping and mailing time. Look for a local printer who has a short turnaround time. If you can't find an amenable printer, why not do it yourself, quickly and easily? Find a software program like PrintingPress which will ease the design process, then use your home computer and printer to do the work. Look for a site such as a hotel or a restaurant that already has cooking staff, or look for a large catering company that's less likely to be totally booked up. Don't stick to just French or Italian restaurants either: imagine the fun of having your wedding at a Mexican restaurant, barbecue joint, tapas bar, sushi restaurant, or a middle-eastern spot complete with belly dancers, particularly if it honors your family's heritage. If your caterer can't provide a cake, a local bakery should be able to whip up a wedding cake given a week-or-so notice. Save them time and yourselves money by getting a smaller display cake and serving the majority of guests from a sheet cake cut in the kitchen. If this all still sounds like too much to you, there are also ways to elope and still eat cake too! With just a little planning, you can make getting married exactly the kind of celebration you'd like it to be.